I love recycling but not for the obvious reason that it is recycling but rather because the ingenuity of it’s reuse intrigues and fascinates me. 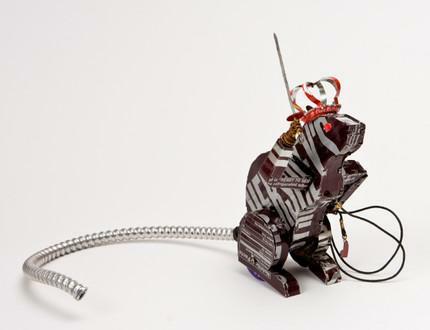 I love what Loran Scrugg does: recycling tins and making toys. My favourite of her creations is this King Chocolate rat below. There is also a great video (below) showing Loran’s tin toy making process. This entry was posted in Blog and tagged Loran Scrugg, making tin toys, Tin Toys, tools, using your hands. Cool idea and video.yes, the rat looks good and itÂ´s my favorite too.